We make cloud work wherever it is hosted and use our skills and knowledge to design and deliver solutions on private, public and hybrid cloud environments. Our Cloud Services are designed to help align your organisation with the key principles of IT Service Management. We offer both Managed Cloud Services and Cloud Intermediation Services Consultancy to enable you to migrate and leverage the benefits of public cloud and architect and deliver hybrid solutions to meet your organisation’s requirements. 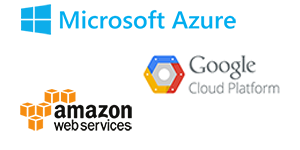 We have experience comparing, configuring, integrating and managing a variety of cloud platforms including AWS, Azure and Google Cloud. All Fordway’s Cloud Services are available on G-Cloud via the Digital Marketplace. High-availability Tier-3 connectivity on our UK purpose architected and assured platform. Cloud Intermediation Consultancy – at ANY stage of your journey! Early stages of cloud adoption? Fordway can help you plan sustainable cloud infrastructure for your organisation from design and build to migration and management. Know the cloud you want? Fordway can provide due diligence on your chosen solution and help implement and manage the transition. At Any stage: advice and consultancy to help you integrate and run your cloud estate effectively and maintain quality assured service delivery. Cloud Intermediation Consultancy and Services – for EVERY stage of your journey! From early stage consultancy helping you formulate a strategy, to migration or monitoring the performance and security of your services Fordway have it covered. If there’s a cloud service you want but can’t find, do let us know!